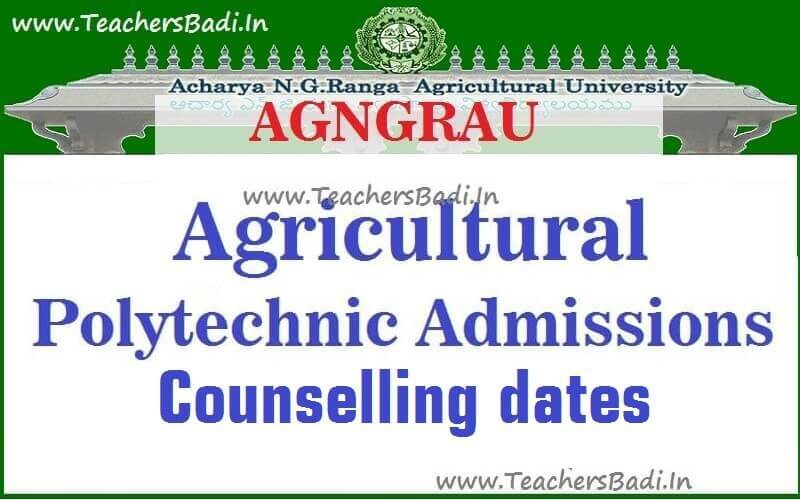 2nd Phase Admissions Counselling dates,1st Phase Admissions Counselling dates, #ANGRAU #Agriculture #Polytechnic Diploma Courses Admissions first Phase Counselling Dates Notification 2018(Agriculture, Seed Technology,Organic Agriculture Agri. Engineering)/I Phase ANGRAU Polytechnic Courses Admissions 2018: The ANGRAU/Acharya N.G. Ranga Agricultural University issued the Agricultural Polytechnic Admission Notification 2018 and the ANGRAU invited the applications from the SSC passed eligible candidates for admission into two year duration Agricultural, Seed Technology Polytechnic Diploma Courses. Organic Agriculture and Three year Diploma in agriculture Engineering courses in Acharya N G Ranga University and its affiliated recognized private Agriculture Polytechnic institutes for the academic year 2018-2019 . The GPA wise counselling schedule indicating the region wise and category wise of the candidates called for counselling and the detailed counselling instructions are available on ANGRAU Agricultural University official website. Candidates are advised to download and go through them carefully before attending the counselling. The First Phase/2nd Phase admissions counseling will be held at the Auditorium, RARS, Lam Farm, Guntur, Andhra Pradesh. Candidates are required to bring the Original Certificates along with two sets of Xerox copies, necessary fee and three latest passport size photographs and these photographs are required to be affixed on admission processing and other forms. 6. Two passport size photographs and 2 Sets of Xerox Copies. Sir 2nd phase counselling agricultural polytechnic dates plz announce.